One hundred years of style by decade and designer. The twentieth century experienced the most fashion changes in history: from hoop skirts to mini skirts, from wearing cotton to plastic. Fashion was as turbulent as the times. Throughout it all, Vogue magazine was there, as the leading visual filter. 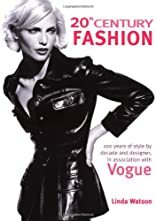 20th Century Fashion, published in association with Vogue magazine, is the definitive style bible for anyone interested in the past, present and future of fashion. It takes a fresh look at fashion history over the twentieth century and charts the evolution from corsets to Coco Chanel to punk. Illustrated with eye-catching archive images, 20th Century Fashion also features the work of the photographers who helped immortalize seminal fashion images. An A-Z section profiles two hundred and fifty of the greatest fashion designers who inspired, created and altered the course of fashion -- from Azzedine Ala�a to Zoran by way of Balenciaga and Yohji Yamamoto. 20th Century Fashion is an informative and inspirational look at how fashion reflects and projects social mores and individual values.